Movie Reviews | ReelDecisions | What should you watch tonight? 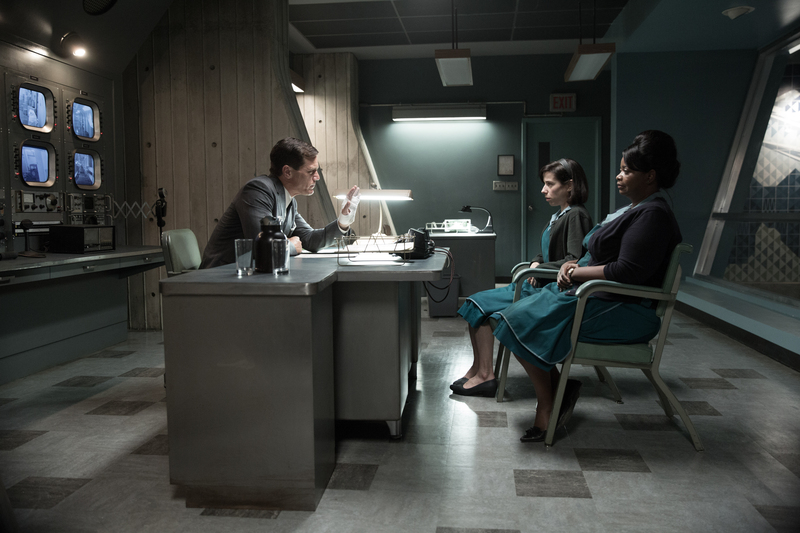 The Shape of Water starring Sally Hawkins, Octavia Spencer, Michael Shannon, Richard Jenkins, and Michael Stuhlbarg. Guillermo del Toro (Pacific Rim, Pan’s Labyrinth, Hellboy) loves to make movies and it’s obvious that actors and members of the production teams love to make movies with him. Those who have worked on The Shape of Water have called it “magical” and “beautiful” and during del Toro’s Best Director award speech at the Golden Globes, he moved his two leading ladies to tears. The love and the respect people seem to have for del Toro certainly translated to the screen and their performances in The Shape of Water. This film was so well received, it has been nominated for thirteen Oscars (just one shy of the record), including the big ones (Best Picture, Best Director, Best Actress, Best Actor, Best Original Screenplay) and a number of the technical ones (Sound Editing, Sound Mixing, Film Editing). Sally Hawkins (Maudie, Blue Jasmine) turns in a performance of a lifetime as Elisa, a mute cleaner at a highly classified government facility who meets and eventually falls in love with an amphibian creature being held captive at the facility. She doesn’t say a word, but through her facial expressions, use of sign language, and that sly smile, you know exactly what she’s feeling. Octavia Spencer (Hidden Figures, The Help) is equally impressive as Zelda, Elisa’s cleaning colleague. She’s funny, doesn’t stop talking, and never really requires a response from Elisa in order to know how she feels about something. It must be difficult to play a part when your lines are like one big rant but it never really shows. The rest of the supporting cast couldn’t be any better – Richard Jenkins, Michael Shannon, and Michael Stuhlbarg. Michael Shannon is an over-the-top villain named Strickland who you despise in every single scene. He never lets up and it’s perfection. The film is set in the 1960’s when everyone was afraid of Russians spies. When a creature from the Amazon is brought into a secret research facility its apparent that the views on how to treat it are opposing. One man wants to learn from it, the other man wants to torture and destroy it before enemies can get their hands on it. In the middle is Elisa, who somehow finds companionship with the strange, misunderstood creature. It’s a weird story that brings together elements from familiar movies like Splash, King Kong, Beauty and the Beast, and Creature from the Black Lagoon – and some may say the narrative has been done before, so why bother? If this type of thing troubles you, if you were angry that Avatar got so much hype even though it was basically Pocahontas, stay at home because this type of fantasy film probably isn’t for you. It’s what a director does with a familiar story – either visually or with beloved characters – that can make all the difference. What James Cameron did to revitalize the popular story with a huge budget, del Toro does with and a small budget and pure passion. This movie is too different to be universally likeable. 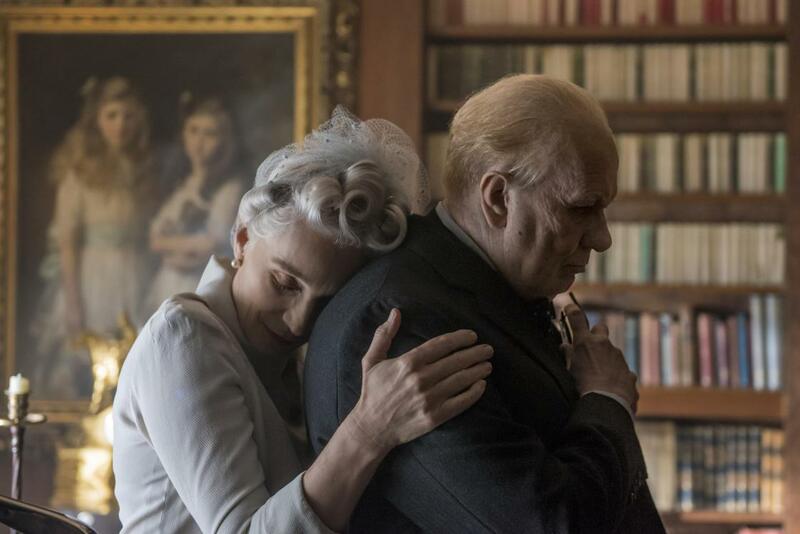 The magical/unbelievable element will throw off some moviegoers– but if you go into it prepared and with an open mind, it’s really hard not to love every minute of it. Guillermo del Toro has said that on a few occasions, his fairy tales have saved his life – The Shape of Water being one of them – and that is evident in how personal the film feels. It explores the loneliness in being different, the dream of being loved and understood, and the harsh cruel realities of the world all at once. The score (Oscar-nominated Alexandre Desplat), the almost-excessive romanticism, and overly adorable characters will either make you smile with delight for two hours or have you rolling your eyes, wishing for it to be over. Like everything, it’s a matter of perspective and what you’re in the mood for. Blade Runner 2049 starring Ryan Gosling, Jared Leto, Harrison Ford, and Robin Wright. When the executive producer of a movie openly admits the movie is too long, and that executive producer is also a director notorious for making movies with 150 min runtimes, you have to believe him when he says it. Blade Runner 2049 is many things: visually stunning, intriguing, artistic, and, as Ridley Scott so delicately put it, “f***ing way too long“. Even if it takes more than one sitting, even if you need a couple bathroom breaks in the 2hrs and 44mins; if you’re a fan of quality sci-fi drama (think Arrival), Blade Runner 2049 is a must-see. Just like the original Blade Runner (directed by Ridley Scott 35 years ago), it’s not for everyone. If you have no patience for slow films and for scenes that are easily 2 minutes longer than they have to be, avoid this sequel like the plague. If you are the DC/Marvel type who needs humour and constant action, avoid this movie like the plague. If you are the other type of movie watcher, sit back and get completely sucked into a new (or not so new) world. Denis Villeneuve (Arrival, Prisoners, Sicario) took a 35-year-old movie and made it fresh and relevant. A very serious Ryan Gosling plays “K”, a young “blade runner” for the L.A. Police Department. Blade runners are tasked with hunting down and retiring old Replicant models, a type of bioengineered android that looks identical to a human. Apparently older Replicants rose up against humans at some point, but that’s not really important. The important thing to know is that Replicants look and act like humans; older models are not wanted and are hunted and killed; and there is a giant, powerful corporation that is experimenting with new models and new features that make it even more difficult to tell the difference. During a routine stop, K stumbles on something strange that requires further investigation. His boss (Robin Wright) tasks him with getting to the bottom of the strange events surrounding the death of an old model, all while trying to stay ahead of the CEO of the corporation (Jared Leto), who wants answers for a very different reason. The story is fairly complex, and although it doesn’t require one to see the original, it probably helps one understand the world a little better. Lucky for fans of the original film, K’s investigation leads him to former blade runner Rick Deckard (Harrison Ford). It’s been 30 years and he’s a little older, but there’s still a lot of fight (and heartache) left in his character, not to mention Mr. Ford himself (see video ‘Ryan Gosling Nearly Knocked Out by Harrison Ford‘). The main features of the movie are the cinematography, production design, and the music/sound – all things that Blade Runner 2049 has been nominated for. 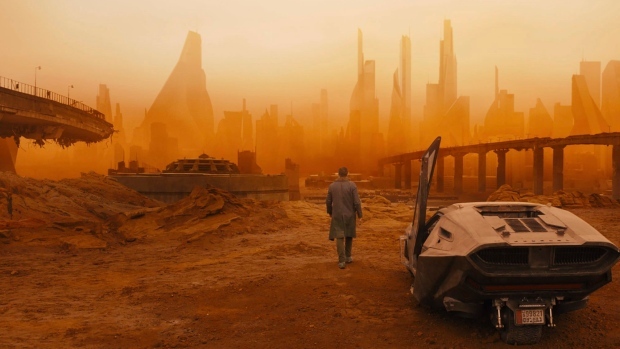 The dusty, dirty, futuristic dystopia is breathtaking in almost every scene. If camera work and set design are not things you typically notice in a film, you will surely notice them in this one. They make the ugly future strangely beautiful. The score is eerily similar to Arrival, so much so that it is hard to believe that Jóhann Jóhannsson had no part in it; in fact, he was replaced by Hans Zimmer (Dunkirk, Interstellar, Inception) and Benjamin Wallfisch (IT) shortly into filming. For a film with fairly limited dialogue, the music is quite noticeable and gives the sweeping landscapes more “oomph”. To sum up, although Blade Runner 2049 is an acquired taste just like the original, it will surely satisfy those who enjoy a science fiction drama with spectacular visuals. Denis Villeneuve brings his typical darker style to the film as well as his talent for perfect endings. Arrival starring Amy Adams, Jeremy Renner, and Forest Whitaker. Canadian director Denis Villeneuve (Prisoners, Sicario, Incendies) has done something extraordinary. Arrival is what had been missing from the 2016 movie year and exactly what was needed, a truly unique and enormously entertaining film. Much more than the average science fiction film, Arrival takes alien encounters very seriously. Amy Adams and Jeremy Renner play the roles of acclaimed linguist Louise Banks and physicist Ian Donnelly, who are called upon by the U.S. Army to provide input on the alien visitors and their gravity-defying ship. They are tasked to find out why they came and what they want. As expected, it can be very difficult to communicate with a being that doesn’t speak or think in terms humans can understand, so they have a long and complicated road ahead if them. It’s both intriguing and entertaining to watch the story unfold. From the get-go, Arrival is unsettling, mostly due to Jóhann Jóhannsson‘s haunting score (listen here). A generally somber mood is crafted right at the beginning with a cryptic monologue by Adams and a series of flashbacks. 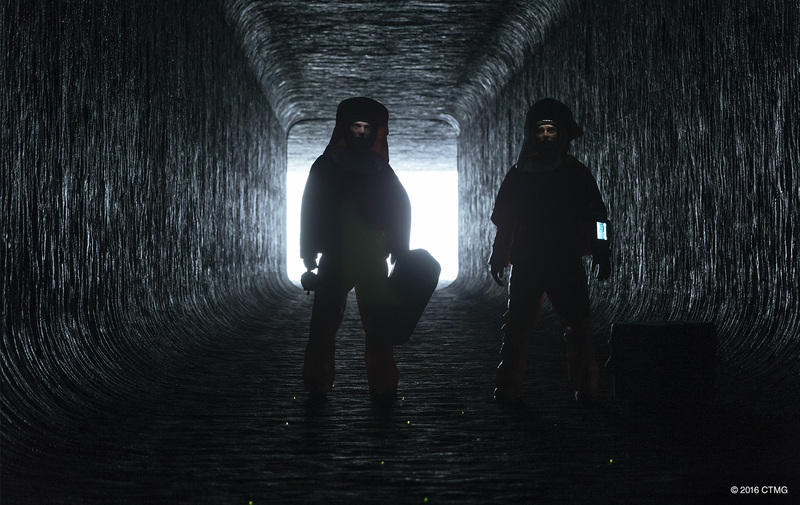 Most of the movie is dark and shadowy with some exceptional cinematography and sleek production design, both of which Arrival received Oscar nominations for. The acting is superb, with a striking performance by Adams, which was sadly ignored by the Academy. Much like Villeneuve’s other films, every scene and conversation has a purpose; no screen time is wasted on cheap science fiction thrills like scary aliens or battle sequences. Arrival is as sophisticated as it is unique. 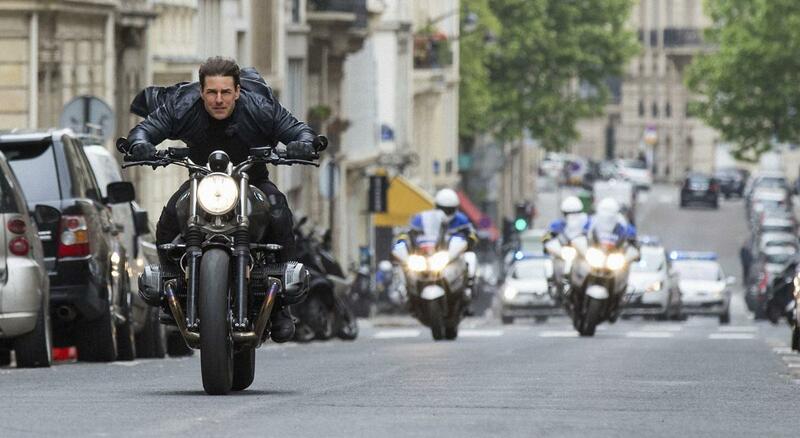 There is some action and some intense moments, but overall it would almost classify as a science fiction drama. If you are in the mood for something light à la Independence Day: Resurgence , you will be very disappointed. The characters are in a race against time to solve a puzzle – in this case an alien language – where the consequences of getting it wrong could mean war. Just shy of 120 minutes, Arrival is a great length and does not take an hour to end once things ramp up (looking at you, Return of the King). It takes you on a complex journey and holds back some key information for a big reveal that will leave you breathless and perhaps even choking back some tears. Some will even think that the movie is over too soon, that there could have been more – more explanations or more conclusions – but in the end, Arrival is as close to perfect as a film can get. Nothing is as it seems, and you’ll probably re-watch it as soon as you can to fully appreciate Villeneuve’s mastery. The film was released in November 2016 and grossed just short of $200M worldwide. Arrival was nominated for eight Oscars, including Best Picture, Best Director, and Best Adapted Screenplay. It ended up walking away with one win for sound editing. 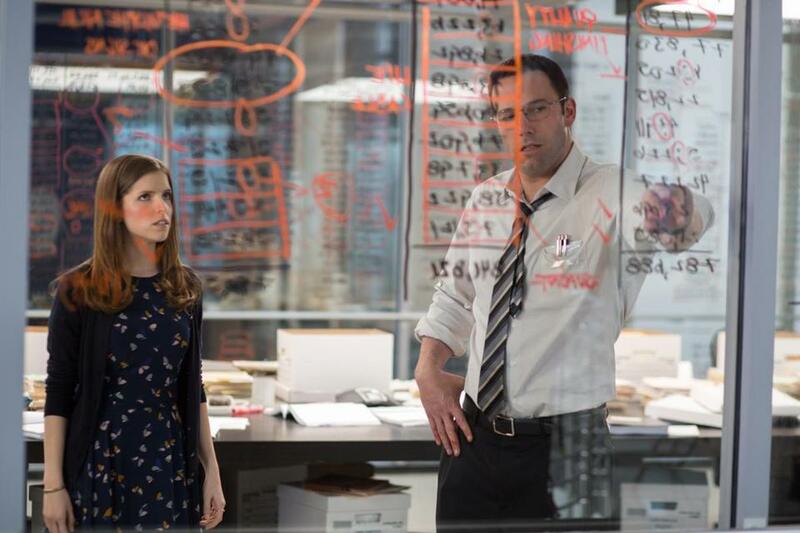 The Accountant starring Ben Affleck, Anna Kendrick, and J.K. Simmons. Director Gavin O’Connor doesn’t have very much to boast about in terms of past films, only 2011’s Warrior can give any sort of indication that he knows what he’s doing – and not many people saw that one – so despite the last minute marketing effort, the expectations for The Accountant were set pretty low. 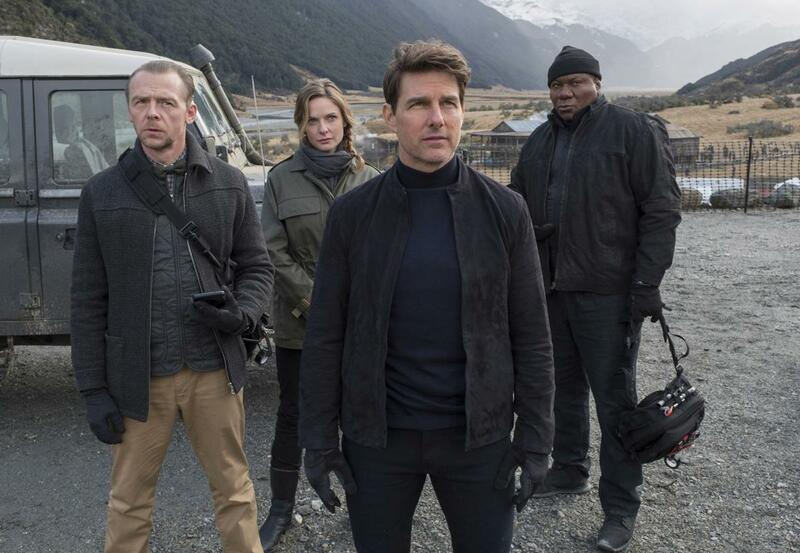 It could go either way, the movie could either be heavily character driven and not nearly as exciting as the previews indicated (like O’Connor’s Pride and Glory), or it could be a standard action-thriller with all the right moves. As it turns out, The Accountant was neither. The action sequences are fast-paced, satisfying, and deadly and the character development is intriguing, dramatic, and tasteful. The successful fusion of both of these genres is what makes the movie interesting and widely appealing. Ben Affleck stars as the main character Christian Wolff, known to the U.S. Treasury Department as “the accountant”, among other aliases. He is a mathematics savant with autistic tendencies who has used his exceptional skills to provide accounting services to the criminal underworld for years, while managing to stay alive between jobs. As expected, he has his unique quirks and his ability to understand social cues is virtually non-existent, but his neurodevelopment disorder is never ridiculed or used as the brunt of the joke in The Accountant. Some scenes and exchanges are amusing, but the general “handling” of the condition (as well as its diagnosis) is in no way offensive. Christian’s other impressive skill, explained in a series of childhood flashbacks, is that he is a killing machine; of course, he only puts this to good use when the situation calls for it and when it appeals to his moral code. When Christian takes on what is thought to be a low-key job investigating some missing money at a robotics company, things start to unravel. Both he and a fellow accountant Dana (Anna Kendrick) find themselves in a situation that calls for him to mostly use his secondary set of skills. Anna Kendrick is delightfully awkward as always and manages to compliment the mostly stoic Affleck. The plot (or plots) is a bit of a mess at times, but the conclusion mostly makes up for any mistakes along the 128-minute pathway. The supporting cast is quite good, with John Lithgow (Interstellar) as the head of the robotics firm, J.K Simmons (Whiplash) and Cynthia Addai-Robinson as the treasury agents hot on Christian’s trail, Jon Bernthal (Sicario) as deadly hitman, and finally Jeffrey Tambor in a small role as a fellow inmate. Critics haven’t been very impressed with The Accountant since its release on October 14, 2016, but audiences have generally found it entertaining and worth watching. It’s not your everyday garden variety action film, nor is it a boring piece solely focused on character development. 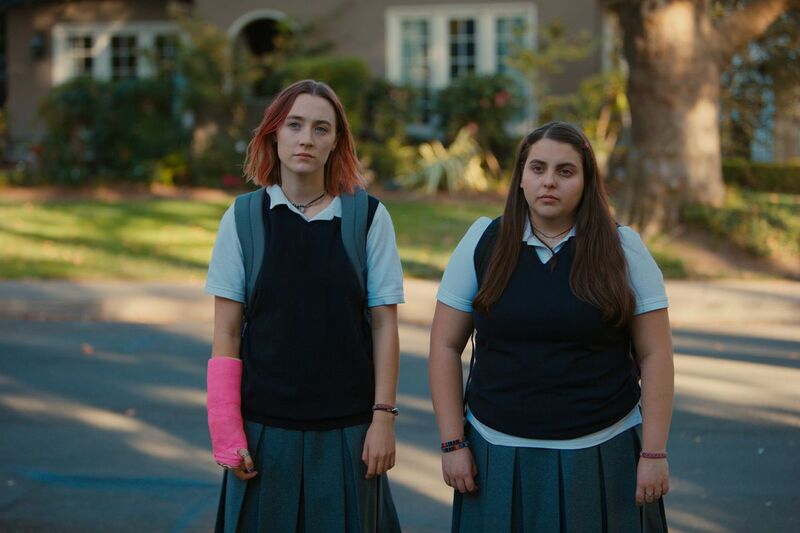 While it won’t win any awards or be remembered for years to come, it takes the good parts from each genre and manages to win you over in the end. The Accountant was a solid #1 hit in its opening weekend, bringing in over $24M domestically (U.S.A). While some may believe Oliver Stone‘s Edward Snowden biopic was made a decade too early (the events in the film occur between 2009 and 2013), there is something to be said for presenting the story to the public while it is still relevant and while things aren’t yet resolved. The details leading up to, and the events surrounding Edward Snowden’s exposure of the U.S Government’s secretive surveillance programs was something Oliver Stone was born to direct (and write), given his penchant for politically controversial topics (the Kennedy assassination and the Vietnam war, for example). The Oscar-winning writer-director of Platoon, Born on the Fourth of July, JFK, and Nixon, to name a few, took on the challenge of capturing the story and also the essence of the man who leaked extremely classified NSA documents to journalists from The Guardian in 2013. Snowden stars Joseph Gordon-Levitt as Edward Snowden, Shailene Woodley as his girlfriend Lindsay Mills, and a number of other accomplished actors as colleagues, friends, and contacts. Familiar faces such as Nicolas Cage, Melissa Leo, Zachary Quinto, Tom Wilkinson, Timothy Olyphant, and Rhys Ifans are featured throughout the film in various roles. 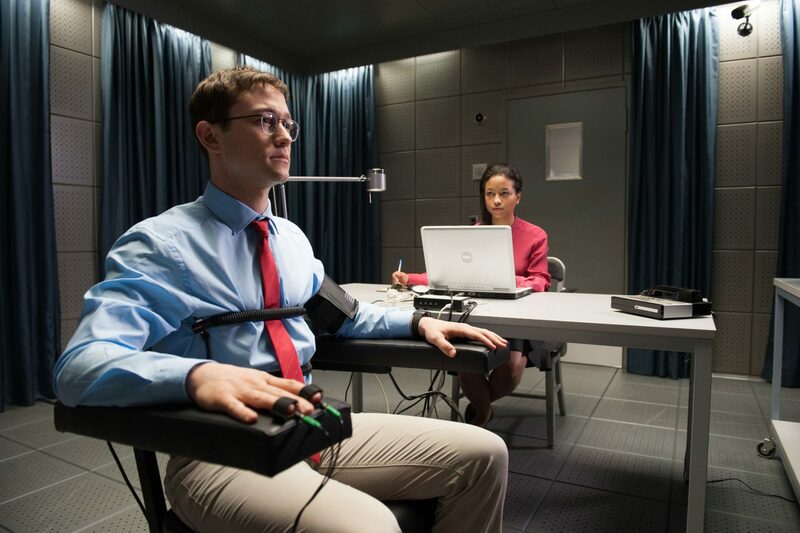 Unlike most other Oliver Stone films, Snowden will appeal to a much larger audience; it’s not as slow-moving or as long as some of his more famous films (which can range anywhere from 2 hrs to a whopping 3 hrs and 12 mins). The topics presented in the film may be complex, but they are explained clearly and certainly spark a sense of alarm and disbelief as the far-reach of the government is presented before your eyes. As one can expect from a movie like this, the world of coding and hacking is displayed in a stylish manner – all flashing lights and visual effects – which generally appeals to everyone aside from computer nerds who tend to know better. Joseph Gordon-Levitt became Edward Snowden in this film. His mannerisms, his speech, even his look is completely captured almost to the point where it becomes creepy. It takes a moment to adjust to the new voice and to stop thinking of it just as an actor’s “really good impression”, but rather a performance – a full embodiment of the character Edward Snowden. It’s a complex thing to try to show the internal struggle of a man torn between being patriotic and doing (what he perceived as) the right thing for his fellow man. The other actors do a great job in their supporting roles, but the focus stays on the subject at hand – Snowden. Even though you know how it ends, the film remains captivating and does not drag on (which tends to happen when a movie pushes past a 2 hr runtime). It can be argued that the film only shows one side of the story and doesn’t take into account the potentially dangerous implications of Snowden’s actions, but it’s the side that needed telling just the same. A striking number of people don’t know the story, or even that it happened in the first place (which is even more shocking); so aside from the Oscar-winning documentary Citizenfour, this is the next best thing to get to know the man behind one of the biggest security breaches in United States intelligence. Snowden was shown at the Toronto International Film Festival in early September 2016 and its wide theatrical release was September 16, 2016. The official runtime is 134 minutes.